1550 b.c.e. marked the end of the pyramid age. The reasons why the Pharaohs abandoned the cult of Osiris and at the same time stopped building large royal pyramids, associated with the cult of Osiris are not explicit in historical accounts. Some historians attributed the change in religious cults to the victory over the Hyksos, but this is because the rise of Amun-Re as the supreme deity of the Egyptians took place immediately following the so called Expulsion of the Hyksos. This does not directly explain why the Osiris cult and the building of pyramids were abandoned, since there is no explanation of why the credit should go to Amun instead of Osiris. There are a number of references in Oahspe which indicate that the Pharaoh Nu-ghan was the one who abandoned the Osirian Religion, established the God King status of the Pharaohs like that of the Old Kingdom, and built the last royal pyramid. At the time of Nu-ghan’s reign as Pharaoh, it had not yet come to pass that there were no more pyramids constructed, and so, it is in retrospect that Nu-ghan is said to be “the last of the pyramidal age of man”. The last royal pyramid is believed to have been built in Abydos, and has been attributed to Ahmose I around 1550 b.c.e. What is left of it today is no more than a wide-spread pile of rubble. || … significance [of Abydos] in Egyptian history cannot be questioned, and many mysteries surround this archaeological site. It was a holy site to the Egyptians, where some of the earliest rulers were probably buried, but it remained a focus of religious activity for thousands of years. or child, could come into the palace or palace grounds without permission. ||3. ......Keep the child, and it shall be both a brother and a son to you. ||Hawara is located near the Fayum oasis, to the South, even, of Meidum, next to one of the channels connecting the Nile to the lake of the oasis. After having abandonned the plan to be buried at Dashur, the southern edge of the Memphite necropolis, Amenemhat III would chose this location, perhaps near to his palace, for his final interment.... The pyramid lay in the north of an elaborate complex enclosed by a wall measuring 385 by 158 metres. This makes the Hawara complex the largest Middle Kingdom funerary complex. The entrance to the complex was located at the southern corner of the east wall. A causeway appears to have led up to it. Unfortunately, almost nothing remains of this vast complex which Greek and Roman visitors, many centuries after it was built, described as a vast labyrinth of open courts, chambers, chapels and hidden crypts. The Greek traveller Herodotos said it had 12 main courts and that the visitor was guided from courtyards into rooms into galleries into more rooms and from there into more courtyards. It is significant that the remnants of Amenemhat’s wall construction found at Hawarra indicate that the wall was made of limestone and not mud-brick, because mud bricks were used extensively in that period, and there are other sites where walls surrounding pyramids and temples (such as Abydos) are made of mud-brick. It is another detail that is in accord with the description in Oahspe. ||....The ruins of Ahmose at Abydos are extensive, not only consisting of a pyramid and mortuary complex, but also the town of the workers who built and later managed the facilities. The mortuary temple that is recognizable as such lies somewhat north of the pyramid. This structure appears for the most part to be the outer section of the temple, with a plan consisting of a massive wall on the east and a central doorway that lead to a forecourt. From the forecourt, a doorway leads to a square court. Foundation blocks at the back might have supported the pillars of a colonade. However, between this section of the temple and the pyramid itself are what probably remains of an inner court where little was found except patches of pavement and four circular granaries along the back wall. Mace also discovered a semi-circular mud-brick deposit that may have either been the remains of a ramp, or the inner sanctuary of the temple. 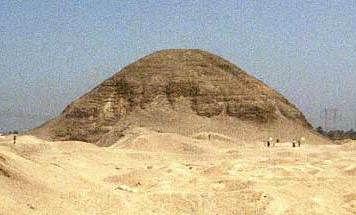 The last royal pyramid to be built was attributed to Ahmose I, now no more than a pile of rubble and sand. 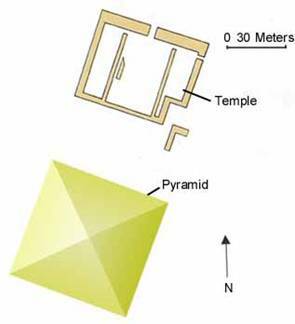 One significant difference between his pyramid and those of his predecessors is that his was built without any mud-bricks, it centre was filled with sand and rubble which lacked sufficient cohesion and strength to withstand the elements after the outside layer of stone was removed by later generations. depicting warrior exploits of the King. 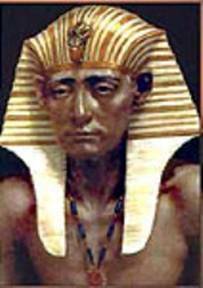 If Ahmose I was Nu-ghan, then, having lost his Hebrew slave population in his first reigning year, he had no slaves to make the many mud-bricks required to build the pyramids as his predecessors had done, and it stands to reason that he would have had to organise some semblance of a labor force to maintain his kingdom. So, it seems that after attempting to round up sufficient slaves, and taking by force and subduing any who would not pay tribute in slaves, he carried on to build his pyramid with a reduced labor force. And so was the beginning of a line of warrior pharaohs of the New Kingdom, who kept their kingdom supplied by conquest of their neighbours, taking slaves as booty. While the last royal pyramid was attributed to Ahmose I, if he was the Pharaoh Nu-ghan, it is a wonder he was even able to build any pyramids at all, but perhaps after various campaigns to subdue rebellious nomarchs under him, he may have acquired sufficient slaves to build an “inferior” pyramid which required less labor. Besides the issue of how the pyramid would be built, remains the question of what precipitated the abandonment of the cult of Osiris after the Exodus of the Hebrews. The two cults of Osiris and Amun-Re are apparent in Ahmose I’s reign. It appears that the form of the pyramid was not abandoned by Ahmose, at the time the cult of Amun-Re was adopted. Neither was it ignored when the site for the Valley of the Kings was chosen by his son, Amenhotep I, since the Valley of the Kings is overlooked by the Pyramid Mountain. As characteristic in Egyptian Religions, the emerging cult, inherits characteristics of the passing cult and reforms them to the new style. Thus we find that the newest God of the Egyptian religion, Baal, is now restyled as Amun-Re, a war god, inspirer of Ahmose I. The fall of the Osiris cult and the establishment of Amun-Re as the dominant God of Egypt is addressed in Parts XI and XII.